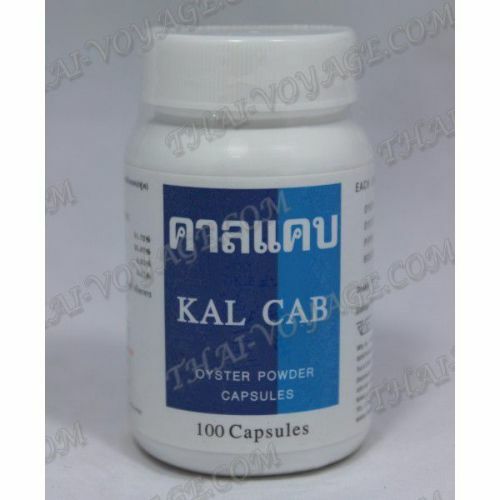 Capsules Kal Cab - a unique product, a natural source of calcium, which is obtained by processing of oyster shells. The drug has anti-allergic and anti-oxidant effect. Calcium is very well absorbed by the body and is necessary for the activity of proteins, enzymes, for example, to improve blood clotting. Minerals have an anti-stress effect, as well as contribute to the removal of salts and heavy metals from the body. Calcium is the basis of bone tissue, is responsible for the health of teeth and is involved in the processes of contraction and relaxation of blood vessels, muscle contraction and transmission of nerve impulses. - In menopause, to prevent osteoporosis. Application: 1-2 capsules once a day after meal (this provides the daily dosage requirement of calcium in the body). Not recommended for pregnant women and small children. In the package of 100 capsules. Composition of the product The composition of each capsule 580 mg: 51.72% of oysters; 25.87% oyster shell powder; 4.31% black pepper; 4.31% Chinese ginger bosenbergiya.